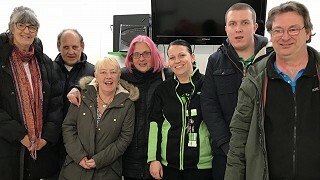 Asda's Community Colleague, Fay Edwards, arranged for a group of GEM participants to have a tour of the Asda store in Bruton Way, Gloucester. This fact finding tour allowed the group to discover the wide range of job roles which are available in a large retail store. They toured areas in the front and back of the store and spoke to several team members on their way round. Faye was also able to give them some support in understanding the online application process and discussed the possibility of work experience placements in the future. Faye is keen to support the GEM Project and fully understands the barriers that some people face when trying to gain employment. Faye said "meeting the individuals from the GEM Project gave us a great opportunity to see what these people have to offer and to help build their confidence in the application process, which some may find quite overwhelming." The GEM participants involved are working with a number of different Navigator Developers from GL Communities, Nelson Trust, GRCC, National Star College and Inclusion Gloucestershire. They all found it a very useful experience, which will help to support them in their next steps.